Note the word gross. In 1989, Jack Nicholson was paid $6m plus a percentage of the box office gross for his role in ‘Batman’. Put simply, he did not give a damn whether the film made money or not, $6m was not enough. 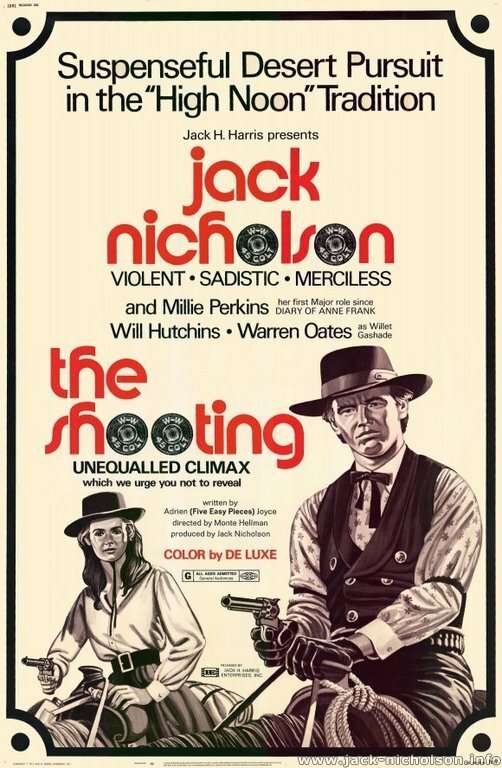 In 1966, he had appeared in ‘The Shooting’. The Western cost $75,000 to make and that included the fees for the actors, wages for the production crew and the feed for the horses. As my mother used to say, ‘some people soon forget themselves’. Filming on ‘The Shooting’ lasted for three weeks and, because of rain, filming had to be abandoned in the first 2 days. The film has been described as an acid Western. For a while, it was possible to argue that ‘The Shooting’ was the strangest Western ever made. Since then, though, it has become fashionable to subvert the genre. Tonto now has a stuffed bird on his head, and the mainstream Western, ‘The Missing’, features an independent female hero whom we first meet when she is on the toilet. Monte Hellmann made ‘The Shooting’ back to back with ‘Ride In The Whirlwind’. The latter Western is unusual because it insists that male virtue and heroism have nothing to do with endurance. Life, it argues, is much more capricious than simple American morality tales. 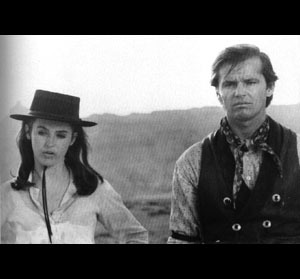 Jack Nicholson who appeared in both films is the lone survivor in ‘Whirlwind’ but more because of luck than ability. The strong men have all perished. Survival and progress is a day to day inheritance rooted in the complicated mix of circumstance and fate. ‘The Shooting’ has been described as an existential Western and compared to Samuel Beckett. It has an ending that is confusing and not just because the symbolism is open to interpretation. Hellman took 12 months to edit the movie, which presumably he did unpaid in his own time. Hellmann was being meticulous yet at the end of the film the audience is unsure as to who has actually been shot. Roger Corman, master of horror quickies, helped produce the film and determined the $75,000 budget. He also insisted that the early scenes in the mining camp had exposition. At least, the plot makes sense. A woman hires Willet Gashade to take her to a town called Kingsley. Willet takes along his mining partner, Coley, because he feels responsible for him and because they think Coin, the brother of Willet, has killed someone in the town. Taking the woman to Kingsley is safer than staying in their camp. The only mystery is what does it all mean. It soon becomes clear that the woman is on the trail of Coin. Sometimes Willet leads, and sometimes it is the woman who decides the trail. The woman has also arranged that a hired gunman follows the small party in the distance. The implication is that we delude ourselves. When we are following we may actually be leading and vice versa. The same dualism exists in the abandonment of others. When the group lose a horse, Coley is told to stay behind by the woman. At this point, Billy Spear, the hired gunman, has joined the group, and his harsh attitude influences her decision. Left alone, though, Coley finds another abandoned man with a broken leg and takes his horse. Like the leaders who are really followers, the abandoned will also abandon. In an existential movie, this clearly has implications because if the actions we perform define our existence and identity and those actions are ambiguous then God help identity. That may sound a complex message for a movie made in three weeks for just over 10% of the salary paid to Jack Nicholson in ‘Batman’ but Monte Hellmann is a singular man. His 1971 film, ‘Two Lane Blacktop’, is equally concerned with identity. In that movie, the characters are distinguished between those who tell lies to others and the 2 heroes whose obsession with cars means that they merely lie to themselves. Similar concerns dominate ‘The Shooting’. By the campfire, Coley asks the woman to tell him her name. She tells him to pick a name he likes. He chooses Hortensia. ‘Don’t ever call me that,’ she says. The woman is the obsessive equivalent of the car nuts in ‘Two Lane Blacktop’. Offered identity as an alternative to obsession, she is obliged to reject it. At the end of the film, Willet confronts his brother who not surprisingly is his double. If Willet survives, and I am not sure if he does, it implies that Willet has shaken off the confusion created by the others and now has a genuine identity. But if the brother has destroyed him, the scene suggests that the revelation of his true self was something unbearable. Expressed this way, of course, we understand why the ending is ambiguous. There is a paradox, and it is that ambiguity has its own obvious truth, which is that none of us know who we really are or what we would do if we ever truly understood ourselves. Some, though, will be curious as to what Hellman thinks makes our identities inauthentic. Well, other people play a part. The group hunting the brother consists of people who will all deny authenticity in the rest but who are essential for the quest. The woman is the obsessive impervious to others. Her obsession makes her will strong but she is so narrow that she is even insensitive to herself. She ignores her own illness. Willet is the dutiful hero familiar to Westerns. His code is important and he is the kind of man we admire but his allegiance to a higher principle means that any sense of self eludes him. Coley is the naive romantic who overestimates himself and misunderstands others. He is warped by a foolish desire for a woman with no interest in anyone. Coley is unable to recognise how easily he will be killed by Billy Spear who is the hired gun played by Jack Nicholson. Spear is the narcissist compelled to be violent and dangerous because of his need for glamour. A fast draw capable of destroying the others, Spear is unable to point his horse in the right direction. We have a group that not only threatens individual identity but a hierarchy that itself has no validity. They misunderstand themselves, while the status and roles within the group depend on deceit. Inevitably, everybody is a phoney. But is it just ever present hierarchy that is the source of damage? When Coley says, ‘I am so hungry I could chew off my arm’, it is not just idle cowpoke chatter. It defines the price modern man pays for his ambition. We have become onanistic vampires whose appetites have been prescribed by advertising. Ultimately, gluttons feed from themselves. The brother that the group pursue is called Coin. The name is pronounced Coen but the spelling should make us suspicious. Perhaps, the hunger for wealth is rooted in the need for an idealised but false identity. We think that poverty or modest income is ‘not us’ and is for other people, which is why we sell ourselves so cheaply. It would be wrong to claim that the ‘The Shooting’ is political. Hellman would have contempt for left wing labels. But his film suggests that our confused identity is not only caused by narrow-minded weakness but can also be a consequence of the wrong-headed deals that we make with the powerful. Not a cheerful film, ‘The Shooting’ has become a cult movie. Maybe it is because as Willet says in the film, we have unsatisfied minds. Or as my mother used to say, ‘some people soon forget themselves’. If you want to read the short story by Howard Jackson, ‘Life After Death’, that has also been compared to Samuel Beckett and is included in the vampire collection ‘Dracula’s Midnight Snacks’ click here. What an excellent critique of a fairly complex film, very interesting detail and approach.